Spice up your dogs palate with these soft vegan dog treats. She'll love the texture and natural sweetness that the dried apples contain. If you can, take a road trip with your dog to a local apple orchard. Most will have days and times for you to self pick as many apples as you'd like. If a farm is not available, a local outdoor farmers market is a great place to purchase fresh apples, and spend quality time with your dog. Combine the lemon juice and water in a small bowl. Set Aside. Peel, core and slice the apple. The more uniform the pieces, the better. Place the apple slices in the lemon bath. Let them soak for 8 minutes. Gently turn them around once or twice. Place the slices on a baking sheet lined with parchment paper. Optional - If you are going to dust your apple slices with cinnamon, or another spice, do so now. Turn off the oven and let them continue cooking for another 10 minutes. Storing: Even though these soft vegan dog treats are dried, they still have moisture in them so they will need to be kept in the refrigerator for no more than 1 week. You can freeze them for up to 2 months. Apples - Choose apples that are fresh with a firm, unblemished skin. Be sure to remove all of the core, pit and seeds, as these can be toxic. Spices - Your choice of spice may depend on what you have on hand. A common friend to apples is cinnamon, so that's what the recipe calls for. However, you can also use allspice or ginger. Just make it a light dusting on the apples before they are dried. 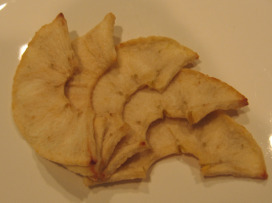 Dehydrator - You are more than welcome to use a dehydrator for this recipe. Just follow the instructions for your particular brand and model. The lemon bath is to help the apples from oxidizing, or turning brown. So, you'll most likely want to do this step whether or not you use a dehydrator or an oven.